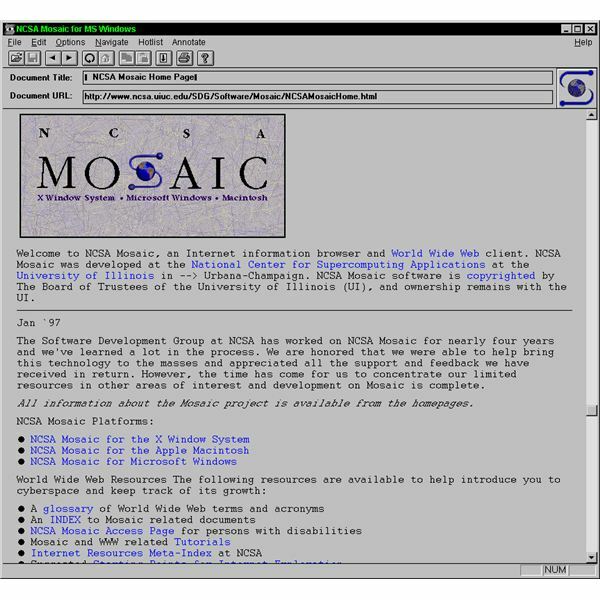 This week the web has celebrated yet another of its 25th birthdays, and boy does that make me feel old. Like many other great inventions, there are several key dates along the way in its origin story. For example, here is a copy of the original email that Tim Berners-Lee sent back in August 1991, along with an explanation of the context of that message. 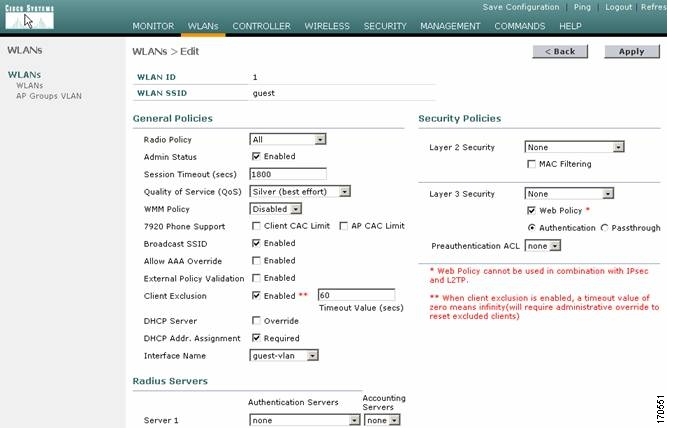 Steven Vaughan-Nichols has a nice walk down memory lane over at ZDnet here. Back in 1995, I had some interesting thoughts about those early days of the web as well. This column draws on one that I wrote then, with some current day updates. I’ve often said that web technology is a lot like radio in the 1920s: station owners are not too sure who is really listening but they are signing up advertisers like crazy, programmers are still feeling around for the best broadcast mechanisms, and standards that are changing fast making for lots of unsure technology that barely works on the best of days. Movies obviously are the metaphor for Java and audio applets and other non-textual additions. So far, I think the best metaphor for the web is that of a book: something that you’d like to have as a reference source, entertaining when you need it, portable (well, if you tote around a laptop), and so full of information that you would rather leave it on your shelf. Back in 1995, I was reminded of so-called “electronic books” that were a big deal. One of my favorites then was a 1993 book/disk package called The Electronic Word by Richard Lanham. It is ironically about how computers have changed the face of written communications. The book is my favorite counter-example of on-line books. Lanham is an English professor at UCLA and the book comes with a Hypercard stack that shows both the power of print and how unsatisfactory reading on the screen can be. Prof. Lanham takes you through some of the editing process in the Hypercard version, showing before and after passages that were included in the print version. But we all don’t want to read stuff on-line, especially dry academic works that contain transcripts of speeches. That is an important design point for webmasters to consider. Many websites are full reference works, and even if we had faster connections to the Internet, we still wouldn’t want to view all that stuff on-screen. Send me a book, or some paper, instead. 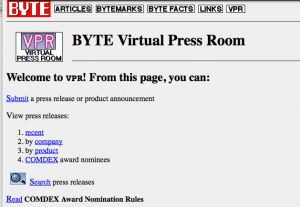 Byte back then had an intriguing idea of having vendors send their press releases electronically, so editors don’t have to plow through the printed ones. But how about a step further in the interest of saving trees: sending in both the links to the vendor’s own websites and whatever keywords are needed. Years later, I am still asking vendors for key information from their press releases. Some things don’t change, no matter what the technology. What separates good books from bad is good indexing and great tables of contents. We use both in books to find our way around: the latter more for reference, the former more for determining interest and where to enter its pages. So how many websites have you visited lately that have either, and have done a reasonable job on both? Not many back in 1995, and not many today, sadly. Some things don’t change. Today we almost take it for granted that numerous enterprise software products have web front-end interfaces, not to mention all the SaaS products that speak native HTML. But back in the mid 1990s, vendors were still struggling with the web interface and trying it on. Cisco had its UniverCD (shown here), which was part CD-ROM and part website. The CD came with a copy of the Mosaic browser so you could look up the latest router firmware and download it online, and when I saw this back in the day I said it was a brilliant use of the two interfaces. Novell (ah, remember them?) had its Market Messenger CD ROM, which also combined the two. There were lots of other book/CD combo packages back then, including Frontier’s Cybersearch product. It had the entire Lycos (a precursor of Google) catalog on CD along with browser and on-ramp tools. Imagine putting the entire index of the Internet on a single CD. Of course, it would be instantly out of date but you can’t fault them for trying. The reason why vendors combined CDs with the web was because bandwidth was precious and sending images down a dial-up line was painful. 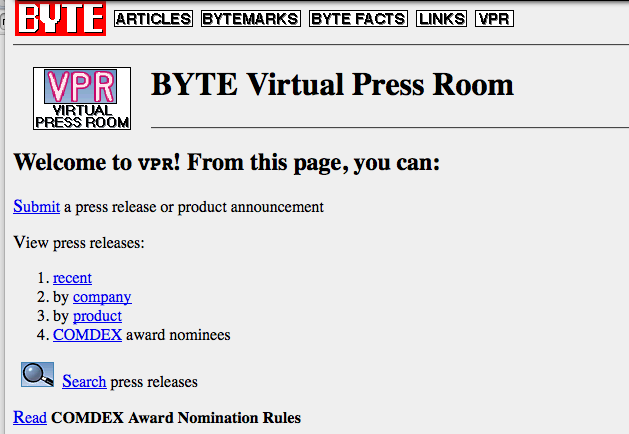 (Remember that the first web browser shown at the top of this column was text-only.) If you could off load these images on to a CD, you could have the best of both worlds. At the time, I said that if we wanted to watch movies, we would go to Blockbuster and rent one. Remember Blockbuster? Now we get annoyed if our favorite flick isn’t available to be immediately streamed online. Yes, the web has come a long ways since its invention, no matter which date you choose to celebrate it. It has been an amazing time to be around and watch its progress, and I count myself lucky that I can use its technology to preserve many of the things that others and I have written about it. This entry was posted in Web applications, Web software by dstrom. Bookmark the permalink. Wow, we really ARE old! “So how many websites have you visited lately that have either?” >> Let’s not ask too much. I’d be thrilled if more websites merely had a search function. Tech vendor sites never seem to have a search box when I need one. Google’s advanced search is fine, if a little out of context.